In a sense, the Victorians Institute and the Victorians Institute Journal are responses to a rising interest in the Victorians manifested by the public, students and scholars. A casual discussion of this subject between Professors Rosemary Sprague of Longwood College and Harry Hargrave of North Carolina State led to speculation that scholars and students of the North Carolina and Virginia area would be willing to gather for a weekend conference to share their interest in the Victorians. They envisioned a Saturday program which would include an informal social period, a luncheon, several short papers delivered by area scholars, and a major paper delivered by an outstanding critic or scholar of the period. A carefully worked out plan and schedule was drawn up and presented to Longwood College, which graciously offered its support of the pilot program. 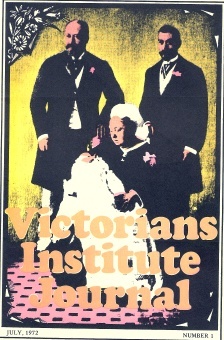 The Victorians Institute was thus created. Sixty people gathered October 24, 1970, to hear Professors Richard Couture (history), William Duke (political science), and Rosemary Sprague (English) present Victorian backgrounds. After the luncheon, J. O. Bailey of Chapel Hill read an analysis of the role of heredity in the works of Thomas Hardy. Although the day whirled past without time for organizing, the group welcomed Longwood’s offer to host a second conference the following year. The program for the October 23, 1971, conference centered on Charles Dickens; the response was highly encouraging. Over one hundred people gathered to hear the papers on Saturday, and a large group began festivities early by attending a Friday evening performance of “The Tempest” by the Longwood-Hampden Sydney Players. At this meeting the group formally organized as the “Victorians Institute”; elected Professors Sprague as President, Hargrave as Secretary, and James McNally as Treasurer; accepted for 1972 the invitation to meet on October 28 at North Carolina State University; and determined to found a journal to publish papers read at the meetings and other research to be solicited by the editors. The Raleigh Meeting will treat the Pre-Raphaelites, with Conrad Festa on Christina Rossetti’s poetry; Donald Stuart on poems by D. G. Rossetti; and Priscilla Roetzel on Pre-Raphaelite poems and paintings. In the afternoon, Joseph Sloane of Chapel Hill will present “Victorian Art: A Slide Lecture.” Also on the agenda is a business meeting which will discuss a constitution and elect officers for the following year. For information and reservations for the October 28, 1971, meeting contact Harry A. Hargrave, English Department, North Carolina State University, Raleigh, N. C. 27602.